The 2010 Ryder Cup is just under 18 months away and the European team has made an important move in its bid to win back the cup at the Celtic Manor. Captain Colin Montgomerie will have one extra wild card pick, bringing his total to three, while America leader Corey Pavin will still have four. Montgomerie will be the first European captain to have three wildcards since Bernard Gallacher in 1993 and it means he has an extra chance of picking a player on form. So it's up to the individual captain on whether or not they are comfortable in picking the extra player themselves and obviously Monty has enough confidence in his own Ryder Cup experience, and so he should, that he will be able to spot who will be the best player to fit in. 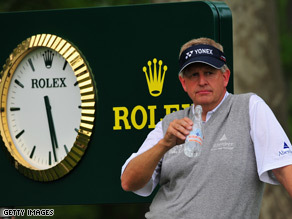 And given that Monty is going to continue playing in the lead up to the Ryder Cup it means he will be right in the thick of the action and the dressing room to gain better insight to who's ready for the heat of a Ryder Cup battle. It's also important that the Players' Committee gave him the vote of confidence in his wish for an extra pick because it backs up their faith in Monty as a leader and decision maker. And let's face it, players who automatically qualify don't necessarily turn out to be the hottest property in the team. Poor old Padraig Harrington was so worn out after his two Major Championship wins last year that by the time he got to Valhalla he was exhausted and his performance definitely showed that. The Living Golf team is finally back in London and away from the heart of the H1N1 flu outbreak, Mexico. Living Golf's Justin Armsden interviewed Lorena Ochoa in Mexico during the early days of the swine flu outbreak. I have to be extra careful as my wife has had cancer and her immune system would be no contest for the virus. So being extra careful brings with it a lonely spell in a flat and a reminder from my wife that this is what life would be like if we got divorced -- cheeky girl! I am not sitting here with any great fear that I have the flu -- even though the trip home involved a total of 12 hours in a plane and a journey through two airports. CNN's doctors suggested three days was enough time for me to be alone to see if I showed any signs of the flu and I am feeling fine. We were extra vigilant during our working week in Mexico and now I am reading reports suggesting that the outbreak may not be as severe as first thought. The first leg from Guadalajara Airport involved wearing a face mask as soon as we arrived, filling out a questionnaire about our health and an examination from a doctor. All passengers went through the process and just about all staff at the airport had face masks on. There was certainly no sense of fear inside the airport -- just another process added to the dozens of other processes when it comes to flying these days. We wore our masks for the three hour plane ride to Houston but once we got there it was a rather different picture. There were fewer people with masks and no-one wore them on the nine hour leg back to Heathrow. I chatted with one businessman about the flu and he seemed not too fussed about it. In fact, I felt there wasn't even a hint of concern by anyone on the plane. Each month Living Golf brings you the best of golf, on and off the course. It brings to an end one of the strangest and almost unbelievable weeks working on the road for CNN. Now I am looking forward finally to winding down the last few hours in this flat and getting home to my wife. The show was supposed to air in May but it has been decided to delay the program because of the sensitive nature of the news surrounding the H1N1 virus. When the Ochoa special does air I think you will enjoy it because her story and that of the growth of golf in Mexico is a very interesting one. It has been a thoroughly enjoyable experience spending time with the world number one and her closest family and friends in Guadalajara, but the concerns over the flu virus have certainly put an uncomfortable edge on the past few days. Pretty much all restaurants and bars are closed and we have avoided crowded places. Our concerns have been eased somewhat by CNN's plan of action for teams in the field when events of this nature occur. We have received plenty of advice from doctors who consult for the company on the exact precautions to take, which is why we decided to stay in Mexico and continue the shoot. The most frustrating precaution was being confined to our hotel rooms most of the time -- Living Golf producer Chris Eldergill took all my money playing cards! Our journey home will be a little more uneasy than usual. Our original plan of travelling back to London via Mexico City has been ditched. We will now head back via Houston. It will involve travelling through two airports and spending about 12 hours in total inside an aircraft. Face masks will be worn the whole way. I hope to return to Guadalajara one day under different circumstances because what I have seen of the city has been quite exceptional. Guadalajara, Mexico's second largest city, is normally a busy metropolis buzzing with activity. Not so during our visit to film with world number one Lorena Ochoa. Since I last wrote a blog, authorities have tightened controls to try and contain the Swine Flu outbreak. Large public gatherings are banned, nightclubs, bars and restaurants have all been closed and we are pretty much confined to our hotel for breakfast, lunch and dinner. A report here said the city is experiencing a calm before a storm of outbreaks. It is a scary prospect for us but we are taking the right precautions to prevent infection and only have two more days left on the shoot. We left our base on Tuesday to continue our filming with Lorena at the Guadalajara Country Club -- a beautiful golf course right in the middle of the city and not a bad place to spend a day. In fact, that's what many teenagers were doing on Tuesday. All the schools have been closed so some students chose to play a round of golf. We hope to get at least one round there before leaving -- it would be such a waste not to play a great looking track. So, no reports yet of a flu victim in Guadalajara but we're not sure how long the city will escape the outbreak as it's only 300 kilometres from the flu's epicentre in Mexico City. We're in Mexico for our Lorena Ochoa focus show and our excitement over the fact she won the Corona Championship in Morelia has been subdued by the outbreak of the Swine Flu. Our attention has been diverted away from covering Lorena's amazing story to exploring reaction to the outbreak from Mexican's living in Morelia and more lately in Lorena's home city of Guadalajara. Both cities are to the west of Mexico City by a few hundred kilometers. Guadalajara is a beautiful city, bathed in sunshine of course, with some wonderful Spanish influenced architecture -- it's a shame that so many people are walking the streets with face masks on. But there is no sense of panic here, more of a sense of business as usual. Our team of three, that includes producer Chris Eldergill and cameraman James Stacey, has to be vigilant as well as it appears the virus is highly contagious. We tried to buy face masks and antiseptic hand wipes but every pharmacy in the city we visited was out of stock -- sold out. So we are washing our hands at every opportunity. As I write this, it's Monday and I have just filed a story for news on the impact of the virus and the fears that it may turn into a pandemic. We are here for the week and hopefully by Tuesday we can get back to focusing on Lorena.